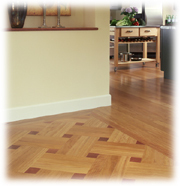 Since 2000 Campbell & Company Hardwood Floors has provided top quality hardwood floors to Marin county and San Francisco. Founded by Jack Campbell after a 25 year career as a general contractor designing and building commercial and residential projects, we continue to be a reliable licensed and insured company whose emphasis is now hardwood flooring. Today the Company is owned and operated by former lead foremen, Jim Leon and Chris Cattich. Jim and Chris continue Jack’s commitment to the industry with membership in the National Wood Flooring Association and attendance at numerous schools and training programs.